Why would you be satisfied with less, when this world has got so much to offer? And one of those things includes a smart bidet toilet seat. Happiness starts with little things, right? Well, with this cleverly designed seat, you will never again think the same about going to the bathroom. Quite the opposite, you will love sitting on a toilet seat, and the fact that you never again have to use a toilet paper. 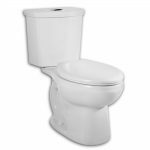 Bidet toilet seats are getting more and more popular with every day, and why they wouldn’t when they offer comfort, reliability, and convenience? So, if you are looking to replace your classic toilet seat, it is time to try one of these handy units. 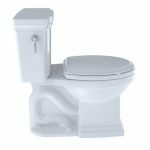 In this article, we bring you a detailed review on the Kohler bidet seat that has all you need. What makes this unit one of the best bidets on the market is the ease of use. Firstly, this unit is easy to install. 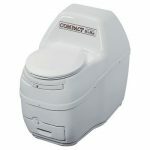 It comes with plastic hinges that have a quick release patent, giving you the opportunity to install the unit in seconds, as well as to remove the seat whenever you want to clean it thoroughly. Of course, if you don’t feel very handy, you could call a professional. However, most reviewers state they had no problem installing in on their own. Kohler ensures that you don’t experience the same problem like with your previous toilets – broken hinges. Namely, the hinges are sturdy, even though they are plastic, and will not break. In addition to that, they allow for a gentle removal of the seat, which contributes to their durability. Secondly, this unit is a pleasure to use. It comes with a remote control, making it ideal for the elderly. 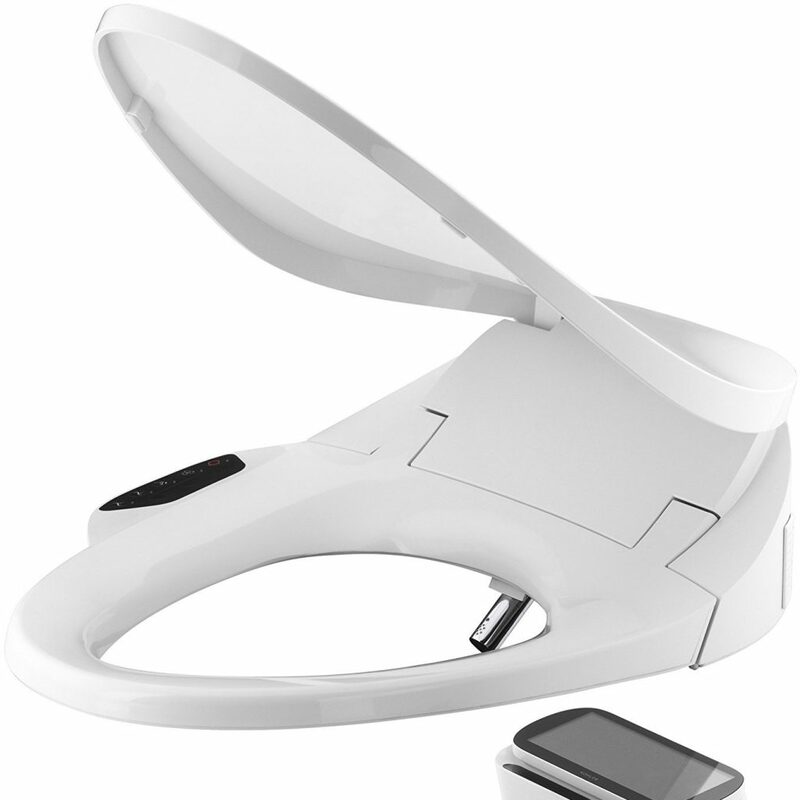 The remote control lets you customize the toilet seat without any effort. 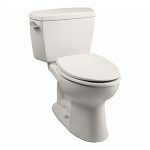 With the adjustable water pressure and the water temperature, you will enjoy every second on this toilet seat. Thanks to Carbon filter traps, the odor will be minimized. And if you think that this is as good as it gets, well, you are wrong. The seat is comfortable and comes with five temperature settings, to suit your desires and preferences. Another great thing about this bidet toilet seat is cleansing. With two nozzles and aerated air, you will finally learn what cleanliness really means. You don’t have to use a toilet paper anymore! Isn’t that awesome? What’s more, you can also adjust the warm-air drying system while the Inline heater ensures the water is at an optimal level. So, getting off the toilet feeling clean has never been easier than now. Finally, this unit is a breeze to clean. 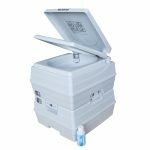 It is made of plastic that is stain resistant and microbial, making this unit highly hygienic and safe. Furthermore, there is this self-cleaning stainless steel wand that you will love. It uses UV light so the bacteria and mold won’t stand a chance. 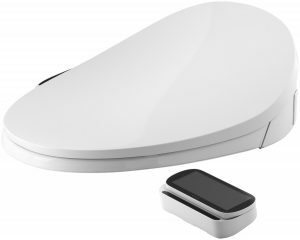 It will automatically sanitize your toilet, leaving it safe and clean. So, as you can see, there isn’t much cleaning for you to do, and definitely not often. However, when it is the time to clean the toilet seat, take it off completely so you can clean it much better. As mentioned, the hinges have a quick release patent. Now, let’s talk about how the Kohler bidet toilet looks. The model we have here has an elongated shape and is white, making it easy to fit onto most standard elongated seats. 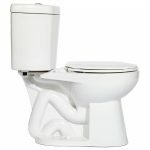 Moreover, this bidet toilet seat looks simple and elegant, adding a nice touch to your toilet. In case, you aren’t fan of an elongated toilet seat, don’t worry, since there are two more shapes to choose from. But, what you will love the most is the LED lighting that looks great at night. It really adds a note of magic to this toilet seat. 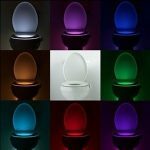 Moreover, it will help you see the toilet seat in the middle of the night, without a need to turn on the light or a separate toilet night light. As already mentioned, this toilet seat is made of plastic. Still, it is reliable and sturdy, so you will use it for years to come. What also contributes to its durability is a soft-close system. Thanks to it, you don’t have to slam the lid. In addition to that, the seat comes with grip tight bumpers, so it will not move around and loose over the time. As for the downsides, the cord is a tad short, so you have to have an outlet close to the toilet. In addition, some users had a difficulty with figuring out how to use some features, so it would not be a bad thing that the instructions would have been more detailed. Lastly, this unit definitely costs more than the average, but it is well worth it. 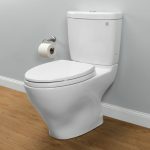 And there you have it – an in depth review on one of the best bidet toilet seats that money can buy. We hope that this article gave you a clear picture of what this unit has to offer, as well as where it falls short. 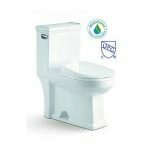 Taking into account all the advantages and disadvantages of the Kohler bidet toilet seat, it is safe to say that this is a high-quality product that will not disappoint. Ready to Purchase the Kohler Bidet?